Paws up to Amy Williams for creating this yummy lavender kitty cupcake, complete with yarn icing and lovely white trim! 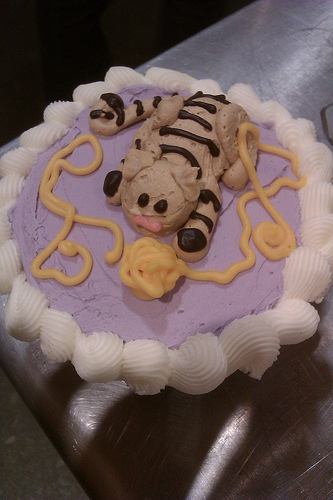 Have you created or spotted any kitty-themed baked goods (or other foods) lately? If so, please submit your sweet tips for Cat Cupcake Tuesdays to catsparella@gmail.com! These cat cupcake Tuesdays always make me hungry! This one is cute with the yarn ball. Looks too cute to eat!